June 28, 2016 – The village of Allakaket will see more activity as BLM Alaska Fire Service steps up its efforts on fires burning in the area. The number of personnel, helicopters and airplanes will increase as BLM AFS installs a Type 3 incident management organization that will coordinate efforts on a cluster of five fires that is being called the Alatna Complex. This management organization will provide a framework for the safe and efficient transition from the initial attack to an extended fire protection mode. The biggest concern is fires burning on the western side of the Alatna River that are threatening nearby cabins and allotments. 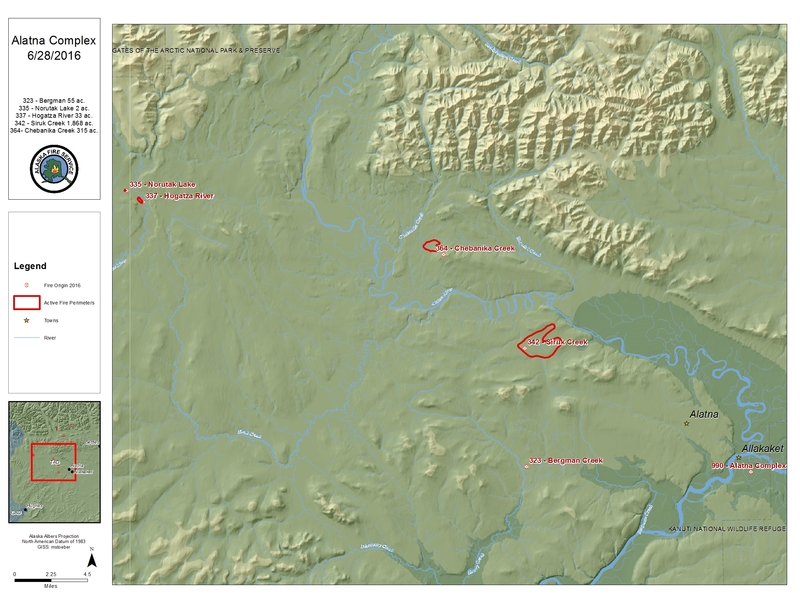 Also, the village Alatna stands about nine miles from the nearest fire. Alatna is directly across the Koyukuk River from Allakaket. Resources are ordered and should be trickling into Allakaket over the next few days. Also, part of this organization’s task will be finding sites along the Alatna River corridor, identifying them and making a plan to protect them. Additional concerns are that the area has experienced windy and dry conditions that are predicted to continue. Plus, the area has a lot of black spruce without many natural barriers to stop fire growth. Fire 342, Siruk Creek (estimated 1,500 acres) –This fire is a priority due to its close proximity to allotments and cabins along the Alatna River. A strategic plan is being developed to protect these sites. Southwest winds have blown the fire toward the river and these sites. A surveillance flight Monday reported the fire to be 70 percent active, backing and running in black spruce. The Yukon Type 2 Initial Attack crew, smaller water-scooping Fire Boss aircraft and miscellaneous overhead personnel have been ordered for this fire. Fire 364, Chebanika Creek (estimated 500 acres) – This fire is burning on the northern side of the Alatna River and seven miles north of the Siruk Creek Fire (342). It has the potential threat to values at risk along the Alatna River. It was reported as 80 percent active at 500 acres in black spruce, so suppression was not feasible on Monday. The Alatna River stands between other fires in this complex. Fire 323, Bergman Creek (estimated 55 acres) – This is actually two fires burning next to each other. They’re located in a modified protection area about 10 miles west of Alatna. The eight smokejumpers that were initially working on this fire successfully knocked it down. They were replaced on Monday by BLM AFS Fire Specialists and a BLM AFS Emergency Firefighting crew from Hughes. The EFF crew from nearby Allakaket was planning on helping mop up the fire today. Fire 335, Norutak Lake (estimated two acres and in a limited protection area) – This fire was showing very little activity as of Monday. Efforts will concentrate on identifying sites of value in the area. It was placed on monitor status. Fire 337, Hogatza River (estimated 40 acres and in a limited protection area) – This fire was also showing very little activity on Monday. The fire was discovered on Sunday and was reported as 70 percent active and creeping on tussock tundra by the Hogatza River. Efforts will concentrate on identifying sites of value in the area. It was placed on monitor status. For more information, contact Beth Ipsen, BLM AFS public affairs specialist at eipsen@blm.gov, (907)356-5511 or (907)388-2159.